Cold and wet outside. My sweetheart is fixing curry carrot soup and walnut burgers on the wood stove. I’m luxuriating in the warmth while reading my bee articles sent to me from Terry in Berkeley. What a great life. curry and carrot? interesting, have to run that by my wife. Thanks for taking the time yesterday in letting me pick out a log for a log bee hive. After Brian Vorwaller carves a face on it, that log will be placed upright like Hal’s log hives and located in my blackberry patch. Thanks also to Moore Mill for letting me trade printing services for it. 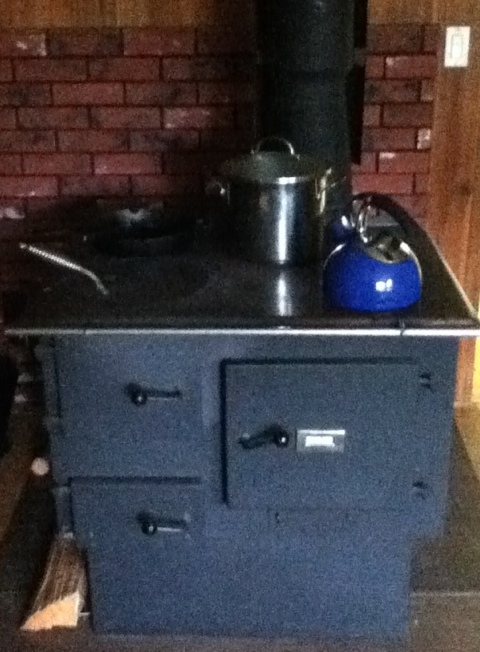 I’m interested to know what kind of kettle you use on your woodstove and how well it works for you. My son placed a fan and an 8″ flexible heating duct that takes the heat from the hottest part of the room and pushes it up into an upstairs bedroom…from there (with the door open) the air comes back down the stairs and circulates back into the living room where the stove is. It’s a great system and heats the whole house.